Lets make a village from the land. Anybody interested? Re-establish our connection with each other, the earth, the stars………in a secret eco-village. Let me know and read of the following inspirational sorts, off the map, over the hill and living below roofs made of the earth. We need a carpenter, an ironmonger, a farmer, a healer and a sage. I shall craft beans and beetroot (and make the tea). Does anybody have a few acres of land to spare? Lets make our dreams reality. Here are these shining lights of Brithdir Mawr, who have been living in seclucion for years, but were found by a survey plane. Our government don’t appreciate this level of freedom, these wooden huts with earthen roofs and sustainable ways, so they demanded they be demolished. 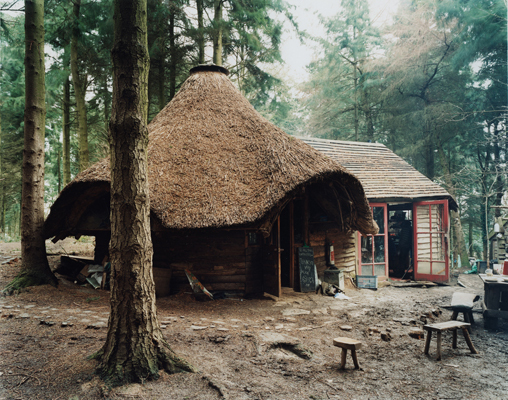 Planning ‘permission’ is needed to build using local natural materials on private land far from anywhere. Permission?! From who! Anyway, good triumphed in the end. I hope to pop down the coast for a visit, I’ll no doubt let you know how it goes. These good people seem to have got it right, thanks to the Daily Mail for covering the story, but…………. ……I like how the Daily Mail refers to this community, living off the land in what could be refered to as a state of financial and material poverty, as ‘middle class’. What a society we live in. Born in a leafy suburb to hard-working parents (indoctrinated by the media and a lingering Victorian work ethic) and then branded for life as one who has benefits from average material wealth and a comprehensive (hardly!) education. Be careful. Read a few books and partial to hummus, you’ll be getting yourself a reputation! READ THE DAILY MAIL, EXPECT THE WORST. THEY SUPPORTED THE NAZIS DONT YOU KNOW. How we cast judgement based on such flawed understanding of our basic humanity. It’s not our fault, it’s the poisoned, sneering hacks at institutions like the Daily Mail. The class system, or the caste system, is maintained by those at the top, maintained by fear (wars, terrorists etc) and can only be conquered by love. Love thy neighbour, as an equal to yourself and all will be well in the world. If we all get together, move back to the land, form communities based on more humane values. How can they stop us? That would be amazing I work in biopharmacuticals however I have qualifications in agriculture. I have 28 sheep and also know how to farm cattle. Let me know how you get on , my email is Ben.lindemann.herpetology@gmail.com .